Please use the email shown above for any official document services. The Wasatch County Sheriff’s Office proudly serves the citizens, property owners and visitors of Wasatch County. In partnership with the community, we will proactively serve and protect our neighborhoods, schools, and businesses using thorough, innovative, and cost effective methods to prevent crime, enforce the law, and rehabilitate those who are incarcerated. Please call (435) 657-3530 and leave a message. The more information you provide about the event in question the better chance we have a making a difference in our community. The Wasatch County Sheriff’s Office serves civil process in Wasatch County. For more information, or to arraign for service of process, please call (435) 654-1098. Complete a GRAMA request form (-pdf format). Please Note: If the investigation underlying or related to the matter is pending, the report will not be released, as permitted by GRAMA. In addition, black and white print-outs are $0.50 per page and color print-outs are $1.00 per page. Copies of fingerprints for applications may be obtained at the Sheriff’s Office (1361 South Highway 40). Present him/herself at the Sheriff’s Office with photo identification. Pay $10 per set of fingerprint copies. Note: Copies of fingerprints may be obtained at any time during the day, and on any day of the week. However, to reduce the wait-time, it is usually in a person’s best interest to inquire during regular business hours or to call 435-657-1619 after business hours. Urinalysis services have been discontinued. As a free service to the community, the Sheriff’s Office will respond when the owner of a vehicle has locked his/her keys inside the vehicle. This service can be requested by contacting the Dispatch Center at 435-654-1411. The Wasatch County Sheriff’s Office does not assume responsibility for any damage with may occur while performing this service and the owner must sign a waiver of liability before the deputy will attempt to unlock the vehicle. Police canine demonstrations are provided by the Wasatch County Sheriff’s Office Canine Division and can be requested by contacting Deputy Mark Ahlberg at 435-657-4740. Memorial dedicated to those who have given everything in service of the people of Wasatch County. The Wasatch County Sheriff’s Office provides service for all types of civil process. However, we cannot provide forms or legal advice for civil process. Please email civil service documents and information to CivilService@wasatch.utah.gov. Court paperwork (i.e. protective orders applications, eviction notices, and divorce papers) may be accessed at www.utcourts.gov. In the Jail’s Housing Sections, Evercom phones are available to be used by incarcerated persons. To use these phones, those incarcerated may call collect, purchase phone cards from commissary, or have their family and/or friends open an account with Evercom. To contact Evercom’s customer support office, please call 1-800-844-6591. Logging-on to www.payforstay.com (on the Internet) and making a deposit using a credit card. Individuals incarcerated at the Jail may ordinarily send correspondence to and receive it from people outside of the facility. They may also receive items such as books, magazines, and some compact discs, but the items must be sent directly from the manufacturer or supplier and must be in its original packaging. The second main responsibility of the Corrections and Court Security Division is to ensure the safety and security of those with judicial business at the Wasatch County Justice Center. Safety is first accomplished by screening everyone that enters the Justice Center. In addition, this Division provides bailiffing services for the Fourth District Court, the Fourth District Juvenile Court, and the Wasatch County Justice Court. The primary duty of a bailiff is to maintain security and order within his or her assigned courtroom. Bailiffs are also responsible for moving incarcerated persons from the jail to the courts for their appearances. Furthermore, the employees in this Division transport those who are incarcerated, adults and juveniles, and who are required to make court appearances. The Wasatch County Sheriff strongly believes that those serving time in jail need to work and repay their debt to society. Many inmates are put to work inside the jail. Correctional officers oversee these individuals as they clean and complete projects in less restricted parts of the Jail. In addition, inmates who meet certain criteria are assigned to work under the direct supervision of a deputy outside of the facility. These inmates provide a valuable service to the community as they clean County-owned buildings, and cut lawns and shovel snow on County-owned properties. Many of the inmate-workers have had chronic employment problems when not incarcerated. As such, the opportunity of being on a work crew often assists them in transitioning back into society and preparing them to obtain and keep respectable employment. Individuals housed at the Wasatch County Jail have the opportunity to study and learn skills in a variety of areas, including math, reading, and computers. In partnership with the Wasatch County School District, those incarcerated are able to earn their high school diploma, if needed. They may also attend drug and alcohol support groups and religious services. These services are, in large part, provided by local volunteers. Volunteers, thank you for your hard work and for donating your time and expertise! A C.I.T. Officer is one who successfully completes a specialized training academy and passes required testing. At the end of the C.I.T. Academy, the officer is certified as a C.I.T. 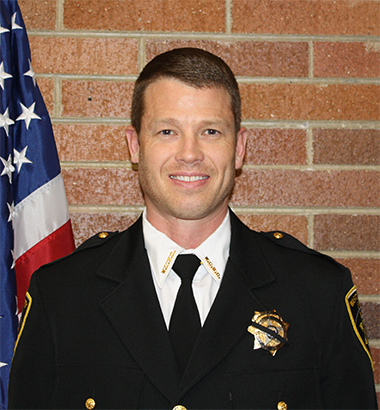 Officer by the State of Utah Division of Substance Abuse and Mental Health. C.I.T. Officers maintain all of the same responsibilities as other officers (e.g. in Patrol or Corrections), but are usually the officers assigned to handle situations involving individuals experiencing mental health crises. A C.I.T. Officer receives broad and generalized training in identifying characteristics of various mental disorders, at least as those disorders are commonly presented in law enforcement and corrections settings. In the C.I.T. Academy, employees frequently find a new level of empathy for those experiencing mental health crises. At the same time, they are trained to protect themselves, and provide, wherever possible, a safe intervention for the person in crises, as well as their family and the community. The C.I.T. Program is a statewide effort that builds strong working partnerships between law enforcement agencies and mental health professionals. Wasatch County Sheriff’s Office has been a part of the C.I.T. Program since 2002. The C.I.T. Program currently has a goal of training 25% of all law enforcement officers in the State of Utah. Because of Sheriff Bonner’s commitment to the C.I.T. Program and its principles, more than 80% of all Office employees (including law enforcement, corrections, and dispatchers) are certified as C.I.T. Officers. The Wasatch County Dispatch Center is responsible for receiving telephone calls (via 911 calls or non-emergency calls to 435-654-1411), obtaining basic information about the incident, and dispatching the appropriate agency to the scene. Providing the address or location description of the incident. Providing a phone number so that the dispatcher can call you back immediately, if the line is disconnected. Communicating the basic events and people involved in the incident. Being willing to answer the dispatcher’s questions. After receiving the information listed above, the Dispatch Center sends the appropriate responders (e.g. E.M.S., FIRE, Search and Rescue, law enforcement, and/or Animal Control) to the scene. They also log the call for service so that the incident is recorded. After the responding crews arrive, the Dispatch Center assists with any telephone calls that need to be made (e.g. to Air Med or Life Flight helicopters, tow trucks, owners of vehicles or animals). When requested by law enforcement, they also research criminal histories and arrest warrants and begin the jail paperwork when a person is arrested. 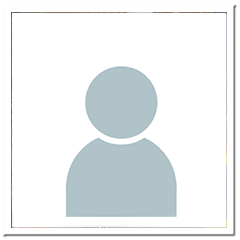 Separate from calls for service, agencies who initiate their own administrative tasks (i.e. training, attending meetings) may request the Dispatch Center to log the incident for their own internal purposes. In catching a glimpse of the work of a 911 dispatcher, some days are very busy and stressful when the call volume is high, or when certain emergency calls come-in (i.e. choking children, crashes involving multiple vehicles, and family disputes). Other days can be slow with only a minimal number of calls for service. One thing is for-sure, the stress level in the Dispatch Center can change at any second, jumping from one extreme to the other almost instantly. Because of that, dispatchers must be multi-taskers, willing to take-on whatever incident the next call brings! Emergency responders consider dispatchers to be their personal life-lines to safety—and rightly so—when something bad happens and an officer needs help, their dispatcher is the person that will get him or her help. Dispatchers, thanks for being, dependable, hard workers! In general, we believe deputy sheriffs work in cooperation with citizens and that our contacts with citizens are positive. To insure that we function efficiently, while maintaining the rights of the citizens we protect, deputies are trained to follow a series of Sheriff’s Office policies and procedures and work within the guidelines of local, state, and federal laws. Because of the nature of law enforcement, we also understand that citizens on occasion may object to the police actions taken by deputies, or may feel their conduct is inappropriate. Therefore, we have established procedures for citizens to report their concerns to the Wasatch County Sheriff’s Office. 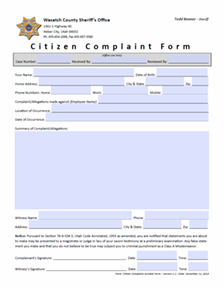 We consider a complaint to be an allegation from any source regarding circumstance(s) of a specific act or omission by a Sheriff’s Office employee which, if later proven to be true, would be misconduct and would normally subject the employee to the progressive disciplinary process or a citizen’s expression of dissatisfaction with an agency policy, procedure, philosophy, service level or legal standard of the Sheriff’s Office. However, we do not consider a disagreement over the elements of a traffic citation to be a complaint. Any disputes over traffic citations received should be taken to the appropriate jurisdictional court for resolution. As a citizen, you are encouraged to contact the Sheriff’s Office if you have a complaint about the actions of a deputy sheriff or non-sworn employee if you believe their conduct was inappropriate or that they have violated the law. 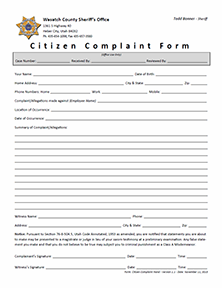 Although we encourage citizens to report police misconduct, complaints must be made in good faith. False or highly exaggerated complaints serve no good purpose for either the citizens or the deputy and only tend to thwart our complaint investigation process. Anyone who willfully makes any false accusation for the purpose of discrediting a deputy sheriff may be prosecuted under Utah State Criminal Code 76-8-504.5 for a Class A misdemeanor. To initiate a complaint, you may contact a supervisor Monday through Friday, from 9:00 A.M. to 3:00 P.M., by calling (435) 654-1098. After hours and on weekends, you may contact our Dispatch Center by calling (435) 654-1411 and request assistance from an on duty law enforcement supervisor. You will be asked to provide a written statement regarding the nature of your complaint with as much detail concerning the incident and why you believe the deputy’s conduct was inappropriate. Substantiated: The investigation established that misconduct occurred. Not Substantiated: The investigation failed to produce sufficient evidence to clearly prove or disprove the allegation. Exonerated: The allegation did occur, but that it was justified, legal and proper. Unfounded: The allegation did not occur. Misconduct Other Than Allegation: Misconduct occurred, but was not a part of the original complaint. Policy Review: The allegation occurred and was in compliance with Sheriff’s Office Policy or policy did not exist. However, it is also determined that the allegation of misconduct could have been prevented had policy been more clear or complete. Upon the completion of an Internal Affairs Investigation, the Chief Deputy or another supervisor will notify the complainant in writing, if the investigation is closed or the status of the complaint and their further right to appeal the decision to the Sheriff. The purpose of the Officer-Involved Critical Incident Protocol is to provide uniform investigative procedures when law enforcement, corrections or special function officers are involved in critical incidents resulting in the injury or death of citizens within Heber City or Wasatch County boundaries. If you are in trouble or need assistance, call 911. Join us is serving our community! Fill out this application, save it to your computer and then email the pdf to Captain Kohler (Kamkohler@gmail.com). You may also print out a paper copy and turn it in toe Sheriff's Office.